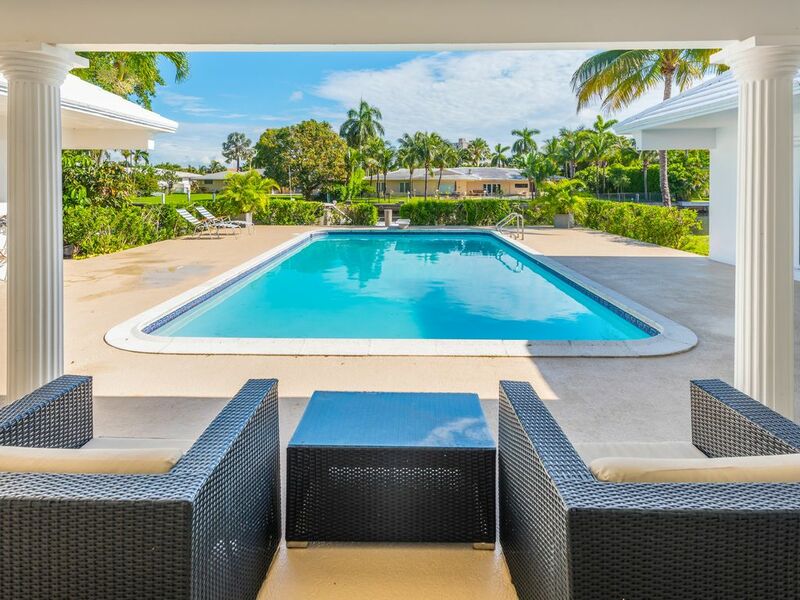 This Tropical Retreat is located in a gated community called the Golden Isles, 424 Alamanda Dr, Hallandale beach.This magnificent flawless property is new to the vacation rental market. You can be one of the first to relax in the large size pool or fish off your brand new private deep 150 foot water dock in your backyard. Bring your own boat or yacht or consider renting a boat for your stay delivered to your back yard (see conditions) and keep in mind, the beaches are just minutes away. To protect your kids from the water dangers, we have installed a fence giving access to the dock. This estate is perfect for a family getaway or a couples retreat. It has two master suites and three guest rooms plus a private office. WIFI covering the entire house. Lots of room to relax in this ranch single story Florida luxury pad. The kitchen is the heart of the home. Truly, a chiefs dream. A six burning gas stove, dual ovens, and refrigeration system are top of the line. Wood floors give the home a elegant and comfortable feel. Having two master suites, both give direct pool views and access. Away from the master suits on the opposite side of the estate, are additional bedrooms with a queen been in each. A very large bathroom sits between the two rooms. Off the main hall and adjacent to a master suite, is another bedroom with a bathroom that has two twin beds, the ideal room for small children. Everything in the home is fresh out of the box from linens to furnishings. Hallandale Beach is located south of Ft Lauderdale in Broward County. Just 9.4 miles south of Ft Lauderdale-Hollywood Airport. This house is 1.8 miles from the beach / parking. Located in close proximity to Gulfstream Racing, Mardi Gras Casino, South Beach and downtown Miami. Close to plenty of shopping and restaurants too! The dream house on the water, in a ideal location... Possibility to rent the 150 foot dock to dock your up to 120 foot boat. Location, dock, ocean access, single story house. Watch the yachts go by from your back yard. The kitchen bar will sit an extra 4 guests. 50' screen TV in dining and TVs in all bedrooms. Possibility to rent a boat. Contact us..
Beautiful house in an excellent location, perfect stay! The property is exactly as described. A spacious and quiet place to rest and spend time with the family, very clean. The swimming pool is clean with warm water. My family enjoyed this vacation home as never before. Children and adults were completely satisfied with this place, no one wanted to leave at the end of our stay. I will certainly come back to this house with my family on my next vacation in Florida. A group of 8 stayed here for 4 days in December 2018. The property has great potential, but needs some care. Water damage from storms was obvious by stains on the blinds and we could smell the mustiness of mildew. Unfortunately, none of the windows would open. The house layout itself is great, although the 4th bedroom and bath near the laundry room is less satisfactory than the others - very low water pressure in that bathroom. The property was tidy and the kitchen was fairly well stocked. The pool was clean and the canal out front provided some interesting wildlife viewing. There were plenty of places to get take-out or shop nearby; a car is a must for that. The manager is very nice and communicated well with us. The garage was not available but there was plenty of parking in the driveway for 4 vehicles. The house was very clean and comfortable for a large group. The house had everything you need in a vacation home. The property was well maintained and the pool was the icing on the cake. We had a great stay at this home. There was plenty of space for me and my sister's family (total of 8 people). The kids really enjoyed the pool too and watching boats on the dock. We also liked that there was a grill and everything you needed in the kitchen. Yves was great to work with and accommodating. Our plane landed early and he was more than glad to make adjustments to his schedule to let us come in early. He also gave us some tips on nearby attractions. The Spruill and Yarrell family. Beautiful layout , house was very spacious and clean. Bbq and outdoor couches were perfect. Terry and family from mtl. Hello,my name it's Maggie. We were staying at this this beautiful house for vacation Dec 26-Jan 3rd 2016. House it's great, looking so much better and much bigger in real than on the picture. Me and my 9 friends had so much fun on the pool,beautiful pictures of canal view,short walking to everything. We're so happy we could stay in this property. Thank you Steve! Mingle with the millionaires in your luxury island estate located on the water in the infamous 'Golden Isles'. The address of the house is: 424 Alamanda Dr, Hallandale Beach. The gated community is perfectly situated off Hallandale Boulevard where you will find unlimited shopping, dining, and entertainment venues day or night. Go to the beach or watch from your pool side the yachts go by. The variety of modern day conveniences mixed and hints of indulgence make this dream house the perfect escape. Just outside your exclusive neighborhood find Starbucks, Grocery Stores, Drug stores, Fine Dining, Casual Dining, Night life, Designer shopping or discount shopping, roll the dice at the Casino, place a bet at the track, or just relax at the beach.... everything you need and more than you could imagine are just outside your Island Neighborhood.